l’Angolo is one of those places akin to Mr. Martino’s that we have been going to for years. Before I even knew the charm of the neighborhood, my family and I celebrated special occasions at these two places. Since moving to the neighborhood, it has become a special place for my husband and me. 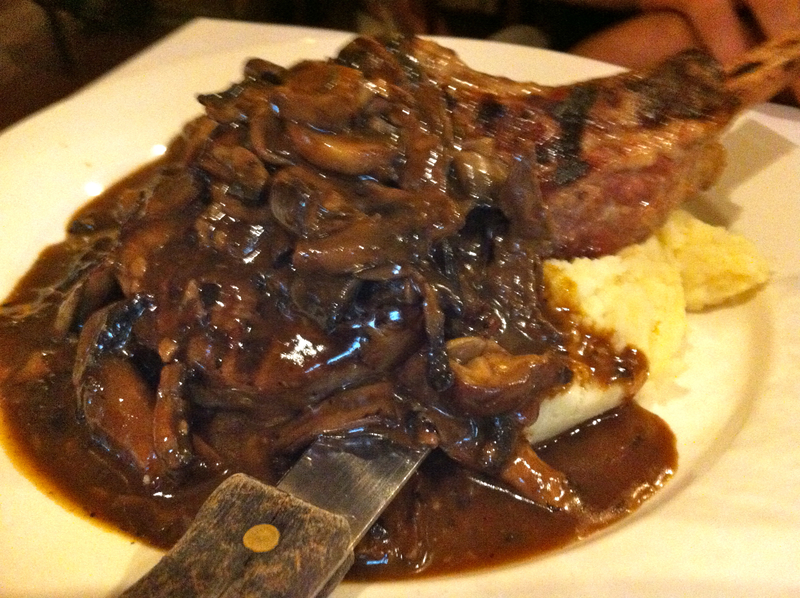 In fact, we often give it top honors as our “favorite” restaurant in Philadelphia. Why? The food is simple and authentic with rich flavors and no pretension in service. Besides, it’s BYO so we can bring a bottle or two of our favorite wine. We walked the eight blocks to the tiny restaurant on the corner of Porter and Rosewood (between Broad and 15th.) As we stepped in, we were greeted by the friendly staff, but both us were drawn to the open kitchen where they were sliding a pan of pappardelle onto a plate. Mmm… Although we were early for our reservation, they were more than able to accommodate us. Something to be said about l’Angolo is that it is a place where anyone can feel at home. As we sat down, two burly, older men to our left were having a conversation about cell phones (“I don’t really check my text messages,” said the man who later discovered he had 59 unread messages.) In the back was a large party celebrating a birthday next to a very tattooed table of four. As we got ready to leave, a younger couple arrived who appeared to be on a first date. Most interesting, however, was the Italian couple next to us. Our waiter obviously knew them and the three babbled away in a thick regional accent–or so I say, I could barely translate a word or two of their conversation. Onto the food. Why is it that it always takes me so long to get to the food? 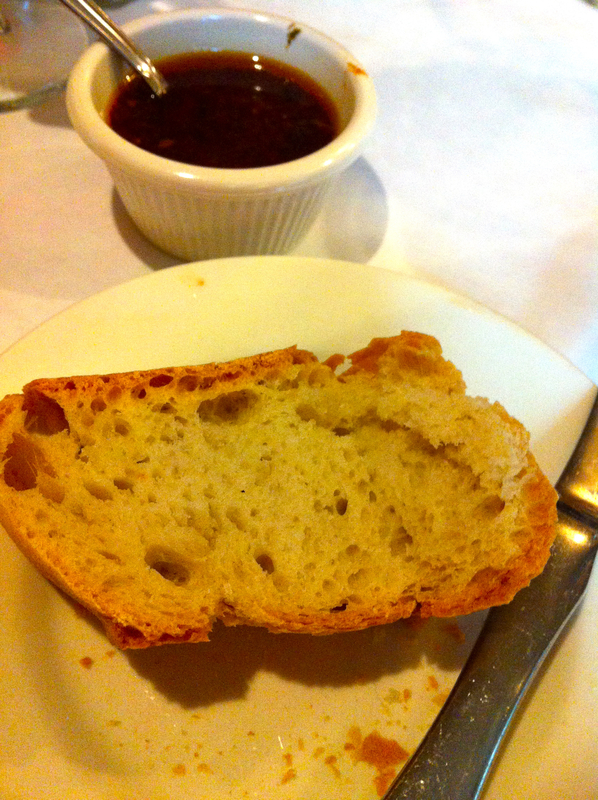 l’Angolo starts each meal with a simple bread basket with a sun-dried tomato pesto. I could, of course, eat it by the spoonful and I may or may not have eaten about 3 slices of bread loaded with this tasty topping. 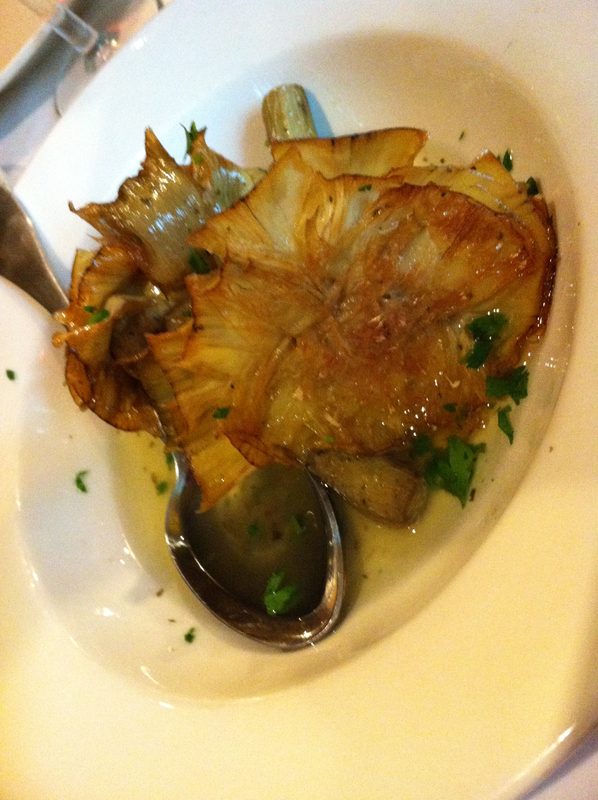 Some time ago, I heard ago l’Angolo’s grilled baby artichoke hearts (carciofi.) They’re not on the menu but if you ask, they’re happy to make them for you. Ever since, I’ve been ordering them. They have a fantastic char and are swimming in garlicky olive oil. 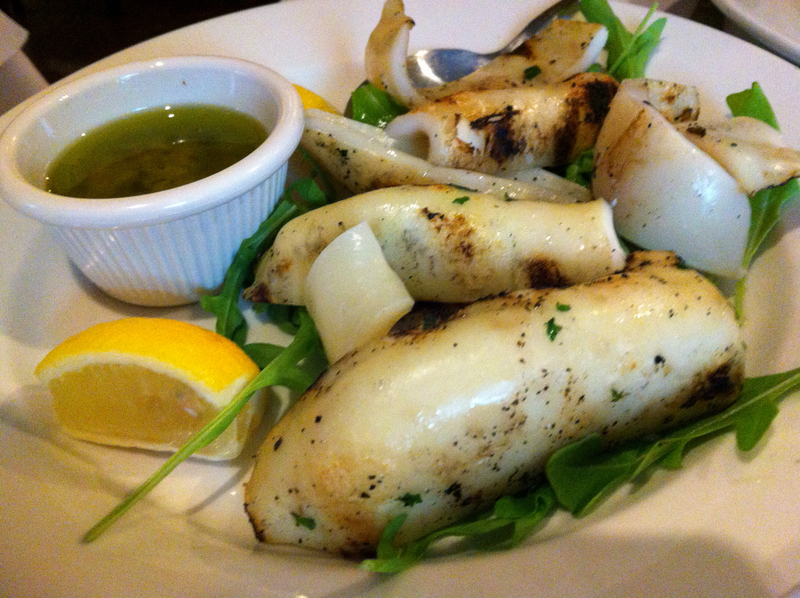 Since we’re both suckers for grilled food, we also got an order of the lemony calamari grigliati (grilled calamari.) Simple, fresh flavors with a great grill flavor. Be sure to rescue some bread from that killer sun dried tomato so you’ll have a couple pieces left to sop up the juices from both of these dishes. When the waiter shared the specials with us, two dishes jumped out. One was a homemade pappardelle with cinghiale (wild boar) ragu. This was what we saw the chef preparing when we walked in. My husband had his eyes on a veal chop that someone at the table behind us had ordered. However, I had a strange hankering for something simple and the spaghetti al pomodoro con ricotta salata jumped out at me. 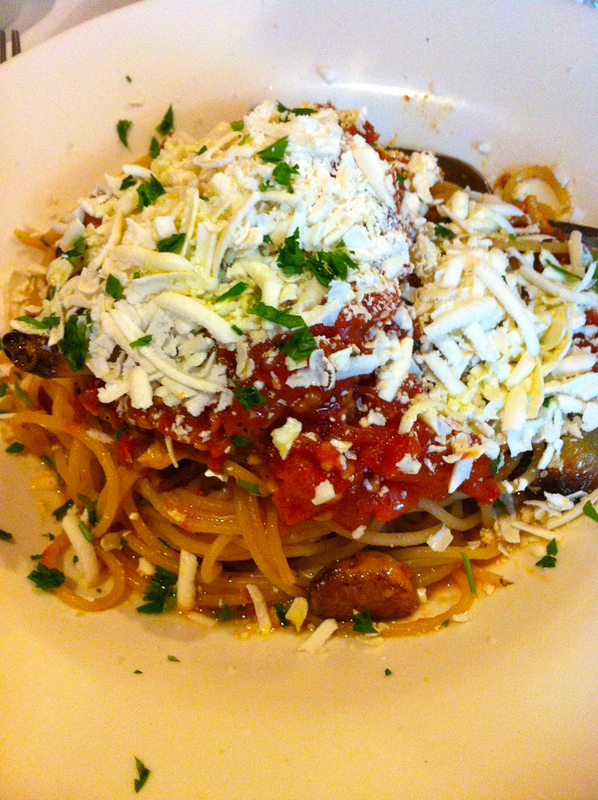 When we learned that we could do pastas in half orders, I cheered with delight! We opted for a half order of the pappardelle special, he got the veal chop special and I went with my gut. The papparedelle came out and boy were we pleased. 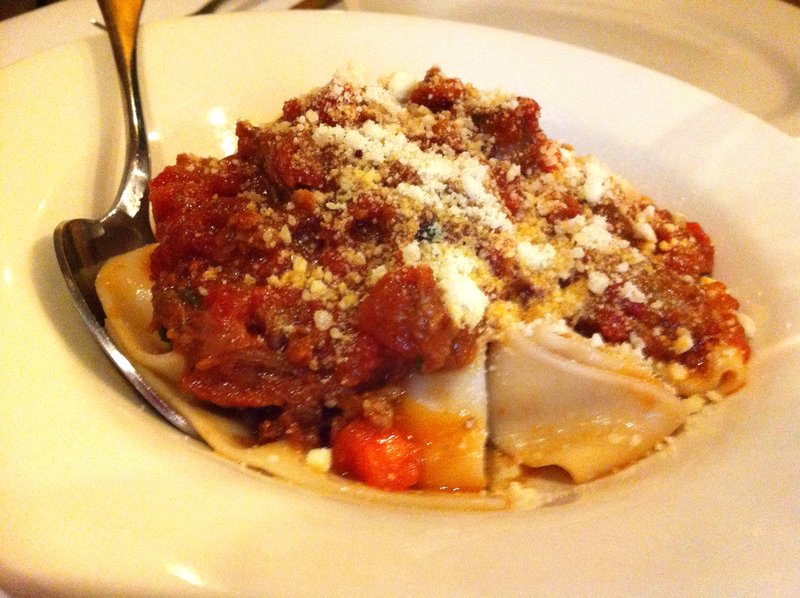 The homemade noodles were chewy ribbons that corralled the ragu perfectly. The ragu, on the other hand, was rich and tender with a mellow tomatoey sauce. We quickly licked our bowl clean. At this point, I was full. Yup, didn’t even get my entree yet and I was full. Of course our entrees arrived. The spaghetti was tossed with oven roasted tomatoes and lots and lots of garlic, topped with a healthy shaving of ricotta salata. You can’t see it in the picture but HELLO GARLIC. There must have been one full head of garlic in the spaghetti. MY KIND OF DISH, although I’m glad I wasn’t on a first date. OK, maybe I wasn’t completely full. Maybe I had just a lil room left. Meanwhile, my husband was attacking this monster. We decided to forgo dessert (being as how I was full before we even hit the entrees,) although I kicked myself for not bringing one of the many bottles of homemade ‘cello in our freezer. Instead, we packed up our leftovers and walked off our lavish Italian meal (which came to under $100, including tip.) We both had our leftovers for breakfast the next day. They were just as good. This looks like such a great meal! and you did an awesome job recapping it and now I really want to go. Those artichokes! The pappardelle! OMG! They have secret arthichokes??? I was thinking about this place the other day and haven’t been in a long time. Can we couple date night there next time I am in Philly? And get the grilled artichokes?